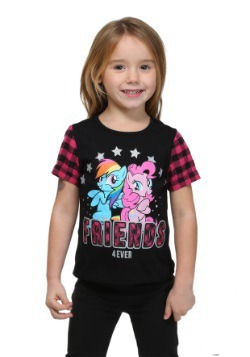 There are so many wonderful ponies throughout the land of Equestria: kind Fluttershy, who takes care of all the other animals; honest Applejack, who works at Sweet Apple Acres; bubbly Sweetie Belle, who represents laughter… But our favorite has always been loyal Rainbow Dash. She is such a cool pony, especially with how she can maintain the weather and clear the skies. 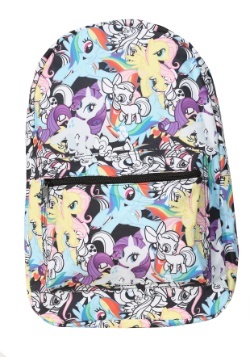 Plus, her rainbow mane and tail are so beautiful! Rainbow isn’t just a pretty face, though. 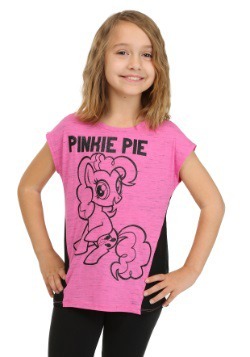 She was the first pony in her class to earn her cutie mark, and she can fly so fast that she creates sonic rainbooms. 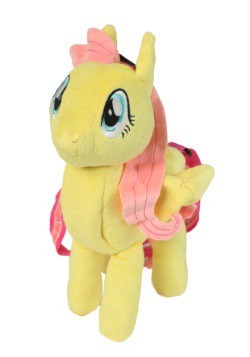 She saved Scootaloo from drowning and protected Fluttershy from bullies, and she helps coach other ponies to get ready for the Equestria Games. 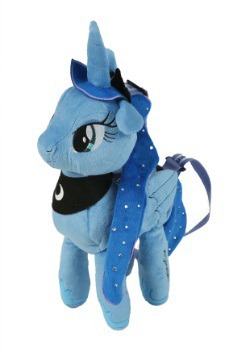 She’s also a part of the Wonderbolts, an elite group of flying ponies. Oh, and she takes good care of Tank, her pet tortoise. Other ponies may have thought it was funny that such a fast pony has such a slow pet, but Tank proved himself when he saved Rainbow Dash when her wing got trapped under a boulder. That just showed that Rainbow knows there are more important things in life than going fast, and that’s a great lesson to learn! 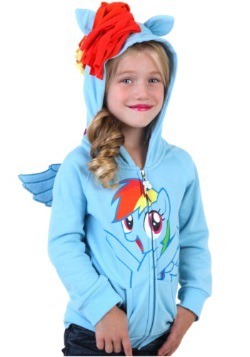 You can channel Rainbow Dash this Rainbow Dash Hoodie. 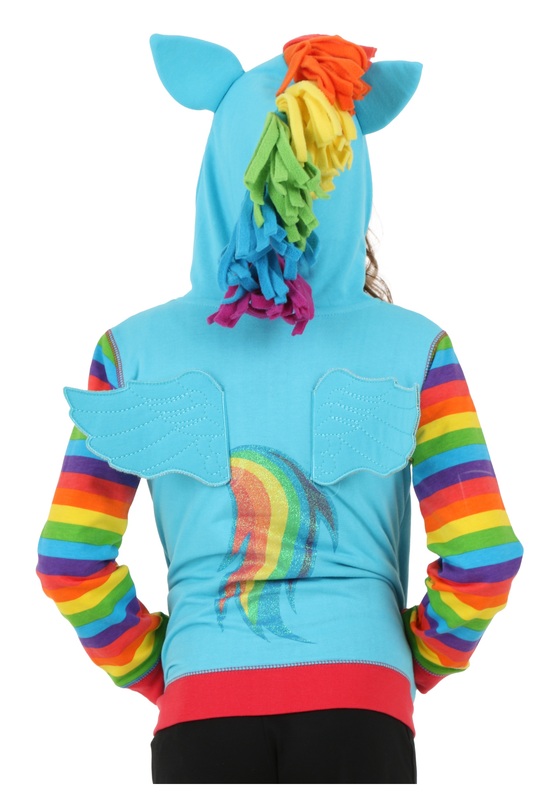 The cotton and polyester zip-up sweatshirt has glitter up front, bright rainbow sleeves, and the gleaming face of Rainbow Dash printed on the front. 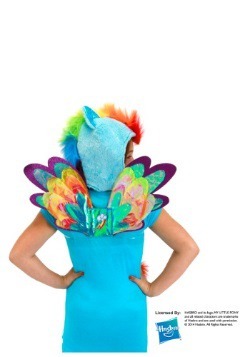 It even has her ears on the top of the hood and her wings on the back! 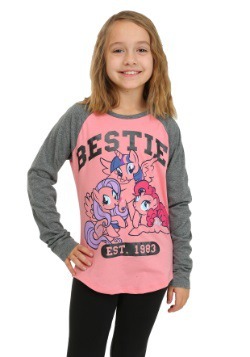 We can’t promise that you’ll be the best flier in all of the human world, but you’ll certainly look the part!